Eric Reid started at linebacker in Sunday’s loss to the Dallas Cowboys, playing 48 snaps, 46 of which saw him line up at or within 6 yards from the line of scrimmage. He struggled adjusting to his new role, posting a game grade of 29.2 against a potent Cowboys rushing attack. 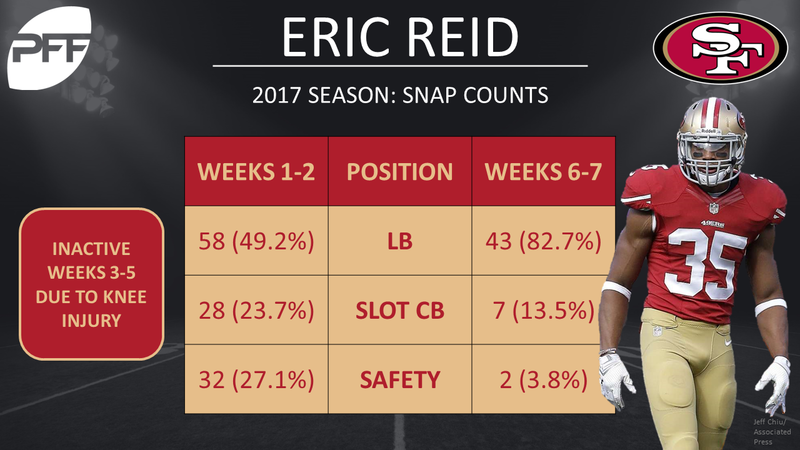 Having started at strong safety for the first 2 weeks of the season, Reid sustained a knee injury which kept him sidelined for Weeks 3-5. During that span he was replaced by former second-round pick Jaquiski Tartt, who excelled in the role, posting game grades of 86.8, 79.7 and 85.8. Reid impressed as a rookie, posting a career best grade of 80.6 in 2013. He followed this up with grades of 75.6 and 72.6 in 2014 and 2015 respectively, but struggled in an injury shortened 2016 campaign which saw him post a season grade of just 50.8. The 49ers may be looking to their divisional rival, the LA Rams, who transitioned former Buccaneers safety Mark Barron to linebacker with great success. Barron saw his PFF grade jump from just 45.6 in 2014 as a safety to 77.8 in 2015 as a linebacker. He is currently having a career year, having posted a PFF grade of 83.7 through the first seven games of 2017.